Why Don’t We Search for Different Life? If we really want to find life on other worlds, why do we keep looking for life based on carbon and water? Why don’t we look for the stuff that’s really different? I’m seeking venture capital for a Universal buffet chain, and I wondering if I need to include whatever the tentacle equivalent of forks is on my operating budget. If there isn’t any life, I’m going to need to stop watching so much science fiction and get on with helping humanity colonize space. Currently, astrobiologists are hard at work searching for life, trying to answer this question. The SETI Institute is scanning radio signals from space, hoping to catch a message. Since humans use radio waves, maybe aliens will too. NASA is using the Curiosity Rover to search for evidence that liquid water existed on the surface of Mars long enough for life to get going. The general rule is if we find liquid water on Earth, we find life. Astronomers are preparing to study the atmospheres of extrasolar planets, looking for gasses that match what we have here on Earth. Isn’t this just intellectually lazy? Do our scientists lack imagination? Aren’t they all supposed to watch Star Trek How do we know that life is going to look anything like the life we have on Earth? Oh, the hubris! Who’s to say aliens will bother to communicate with radio waves, and will transcend this quaint transmission system and use beams of neutrinos instead. Or physics we haven’t even discovered yet? Perhaps they talk using microwaves and you can tell what the aliens are saying by how your face gets warmed up. And how do we know that life needs to depend on water and carbon? Why not silicon-based lifeforms, or beings which are pure energy? What about aliens that breathe pure molten boron and excrete seahorse dreams? Why don’t these scientists expand their search to include life as we don’t know it? Why are they so closed-minded? In 1976, two Viking spacecraft landed on Mars. The image is of a model of the Viking lander, along with astronomer and pioneering astrobiologist Carl Sagan. Each lander was equipped with life detection experiments designed to detect life based on its metabolic activities. The reality is they’re just being careful. A question this important requires good evidence. Consider the search for life on Mars. Back in the 1970s, the Viking Lander carried an experiment that would expose Martian soil to water and nutrients, and then try to detect out-gassing from microbes. The result of the experiment was inconclusive, and scientists still argue over the results today. If you’re going to answer a question like this, you want to be conclusive. Also, getting to Mars is pretty challenging to begin with. You probably don’t want to “half-axe” your science. The current search for life is incremental and exhaustive. NASA’s Spirit and Opportunity searched for evidence that liquid water once existed on the surface of Mars. They found evidence of ancient water many times, in different locations. The fact that water once existed on the surface of Mars is established. Curiosity has extended this line of research, looking for evidence that water existed on the surface of Mars for long periods of time. Long enough that life could have thrived. Once again, the rover has turned up the evidence that scientists were hoping to see. Mars was once hospitable for life, for long periods of time. The next batch of missions will actually search for life, both on the surface of Mars and bringing back samples to Earth so we can study them here. The search for life is slow and laborious because that’s how science works. You start with the assumption that since water is necessary for life on Earth, it makes sense to just check other water in the Solar System. It’s the low hanging fruit, then once you’ve exhausted all the easy options, you get really creative. An illustration of a Titanic lake by Ron Miller. All rights reserved. Used with permission. Scientists have gotten really creative about how and where they could search for life. Astrobiologists have considered other liquids that could be conducive for life. Instead of water, it’s possible that alternative forms of life could use liquid methane or ammonia as a solvent for its biological processes. In fact, this environment exists on the surface of Titan. But even if we did send a rover to Titan, how would we even know what to look for? We understand how life works here, so we know what kinds of evidence to pursue. But kind of what evidence would be required to convince you there’s life as you don’t understand it? Really compelling evidence. Go ahead and propose some alternative forms of life and how you think we’d go searching for it in the comments. Thanks for watching! Never miss an episode by clicking subscribe. Our Patreon community is the reason these shows happen. We’d like to thank Kuri the Vegan Traveller and Craig Hayes, and the rest of the members who support us in making great space and astronomy content. Members get advance access to episodes, extras, contests, and other shenanigans with Jay, myself and the rest of the team. Want to get in on the action? Click here. Jupiter is like a jawbreaker. Dig down beneath the swirling clouds and you’ll pass through layer after layer of exotic forms of hydrogen. What’s down there, deep within Jupiter? What’s inside Jupiter? Is it chameleons? Candy? Cake? Cheddar? Chemtrails? No one knows. No one can ever know. Well, that’s not entirely true… or even remotely true. Jupiter is the largest planet in the Solar System and two and a half times the mass of the other planets combined. It’s a gas giant, like Saturn, Uranus, and Neptune. It’s almost 90% hydrogen and 10% helium, and then other trace materials, like methane, ammonia, water and some other stuff. What would be a gas on Earth behaves in very strange ways under Jupiter’s massive pressure and temperatures. So what’s deep down inside Jupiter? What are the various layers and levels, and can I keep thinking of it like a jawbreaker? At the very center of Jupiter is its dense core. Astronomers aren’t sure if there’s a rocky region deep down inside. It’s actually possible that there’s twelve to forty five Earth masses of rocky material within the planet’s core. Now this could be rock, or hydrogen and helium under such enormous forces that it just acts that way. But you couldn’t stand on it. The temperatures are 35,000 degrees C. The pressures are incomprehensible. Surrounding the core is a vast region made up of hydrogen. But it’s not a gas. The pressure and temperature transforms the hydrogen into an exotic form of liquid metallic hydrogen, similar to the liquid mercury you’d see in a thermometer. This metallic hydrogen region turns inside the planet, and acts like an electric dynamo. Similar to our planet’s own iron core, this gives the planet a powerful magnetic field. The next level up is still liquid hydrogen, but the pressure’s lower, so it’s not metallic any more. And then above this is the planet’s atmosphere. The upper layers of Jupiter’s atmosphere is the only part we can see. Those bands on the planet are clouds of ammonia that rotate around the planet in alternating directions. The lighter color zones are colder ammonia ice upwelling from below. Here’s the exciting part. Astronomers aren’t sure what the darker regions are. This animated gif shows Voyager 1’s approach to Jupiter during a period of over 60 Jupiter days in 1979. Credit: NASA. Still think you want to descend into Jupiter, to try and walk on its rocky interior? NASA tried that. In order to protect Jupiter’s moons from contamination, NASA decided to crash the Galileo spacecraft into the planet at the end of its mission. It only got point two percent of the way down through Jupiter’s radius before it was completely destroyed. Jupiter is a remarkably different world from our own. With all that gravity, normally lightweight hydrogen behaves in completely exotic ways. Hopefully in the future we’ll learn more about this amazing planet we share our Solar System with. What do you think? Is there a rocky core deep down inside Jupiter? There’s a cooling problem on station, and two astronauts are ready to head outside to fix it. NASA astronauts Rick Mastracchio (a six-time spacewalker) and Mike Hopkins (a rookie) are expected to spend 6.5 hours “outside” starting at 7:10 a.m. EST (12:10 p.m. UTC) on Saturday. On robotics will be Japanese astronaut Koichi Wakata, who has operated every bit of robotics currently on station. Click to watch Expedition 38’s crew action live above. (If for some reason the stream is not working, an alternate link is available here.) We’ll have full coverage of the spacewalk after it happens, too. For a walkthrough of what’s going to happen, NASA handily provided a video that you can see below the jump. We also have links to all of our coverage so far. In a nutshell, here’s what happened: a cooling loop shut down automatically on station Dec. 11 when the loop got too cold. NASA traced the problem to a faulty flow control valve inside of the pump. 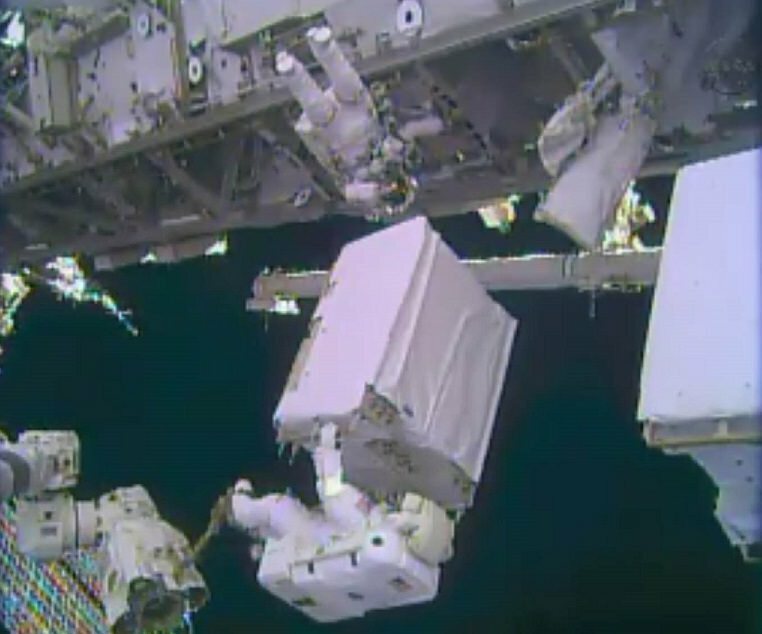 As agency officials prepared for a spacewalk just in case, NASA attempted to fix the valve and then control an alternate one from the ground. However, the station is entering a time when there will be a lot of sun shining on it, making dockings and spacewalks difficult. To be prudent, NASA decided to do a spacewalk now and replace the pump. To keep the astronauts safe if another spacesuit leak happens again, the agency has introduced soaker pads and snorkels to the spacesuits. When you learned to drive a car for the first time, remember how comforting it was to have an experienced driver beside you, able to anticipate the hazards and keep you on schedule? That’s surely how the Expedition 38 crew feels about one of the voices “on the line” as two astronauts prepare to venture outside to replace a crippled ammonia pump. One of the “CapComs” or people communicating with the crew on Saturday, Monday and Wednesday will be astronaut Doug Wheelock — who just happens to be known for co-replacing a broken ammonia tank himself in 2010. (The other CapCom is Japanese astronaut Aki Hoshide, who will chat through robotic procedures with Koichi Wakata). Wheelock is the visible edge of hundreds — likely thousands — of people working feverishly at NASA and its international partners this past week to get the spacewalks ready through pool simulations, a virtual reality lab and other means. 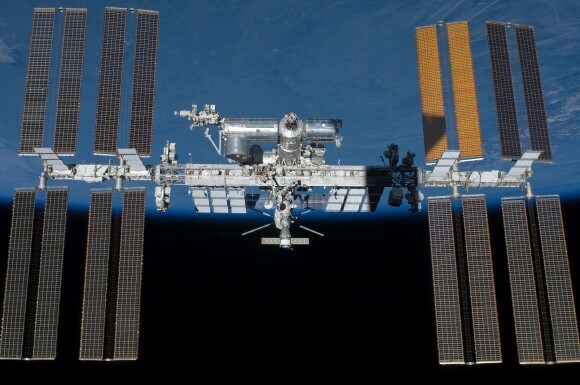 Several backup and non-critical space station systems are offline because of that pump, which has to regulate temperatures properly for vital electronics to work. “I am their choreographer,” Wheelock told Universe Today of his plan for the astronauts. While spacewalkers Mike Hopkins and Rick Mastracchio already know what they are supposed to do when, Wheelock said he will be “their eyes and ears on the timeline.” If something needs to be stopped or changed, he’ll help them figure out what to do next. Wheelock and fellow astronaut Tracy Caldwell Dyson had to spring into action themselves in August 2010. 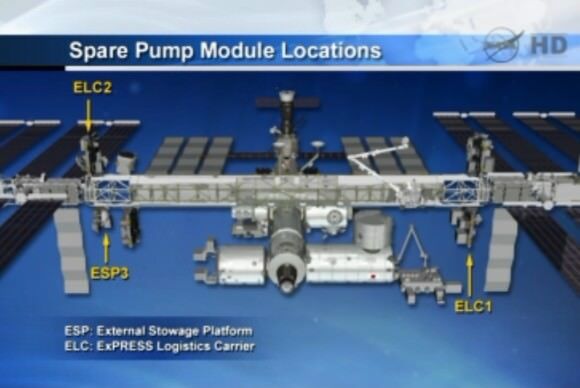 A pump in the same location broke, forcing space station systems offline and requiring them to go outside a few days later. 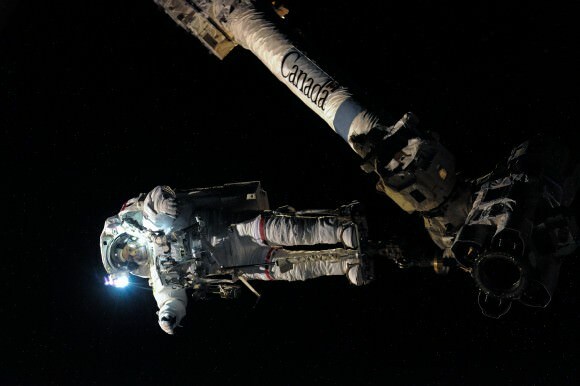 With astronaut Shannon Walker piloting Canadarm2, the astronauts accomplished their tasks in three spacewalks — but encountered obstacles along the way. During the first spacewalk, as Wheelock disconnected lines from the broken pump, he not only faced a pipe that wouldn’t let go, but a shower of ammonia snowflakes. That was “what got me on the EVA [extra-vehicular activity],” he recalled. That’s why NASA plans to lower the line pressure on the cooling system before the astronauts head outside this time. Normally the lines are pressurized at 360 pounds per square inch, but they’ll be lowered to 120 psi through commands from the ground. Other “lessons learned” are more recent. Italian astronaut Luca Parmitano was wearing a NASA spacesuit in July when he experienced a water leak in his helmet, putting him at risk and terminating the spacewalk early. This will be the first spacewalk since that time. NASA believes it has replaced the part of the suit that failed, but the agency has new backups in place. Hopkins and Mastracchio will have soaker pads in their helmets as well as a “snorkel”-like device, or tube that will let them breathe oxygen from a different part of the suit if water flows into the helmet again. So what are some key parts of the spacewalks to look for? Wheelock identified a few spots. ‘HAP’ check. That soaker pad is called a “helmet absorption pad”, and as a matter of course the astronauts will be asked to verify that the pad is not wet at the same time that they also check their gloves for tears (another lesson learned from a past spacewalk.) So you will hear Wheelock calling “HAP check” from time to time to the crew. Unlatching and latching the ammonia connectors on the pumps. Because this is when leaks are most likely to occur — posing a risk to Mastracchio, who is performing the work — Wheelock is going to do a “challenge and response” procedure. He will read up the step, the astronaut will verify it and will do the work. There will be “a lot more chatter on the [voice] loop” during those times, Wheelock said, with everyone on the ground watching through Mastracchio’s head camera feed (visible at the front of the room) to see what is happening. “There will be a lot of people standing in Mission Control at that point,” he joked, himself included. Leak procedures. 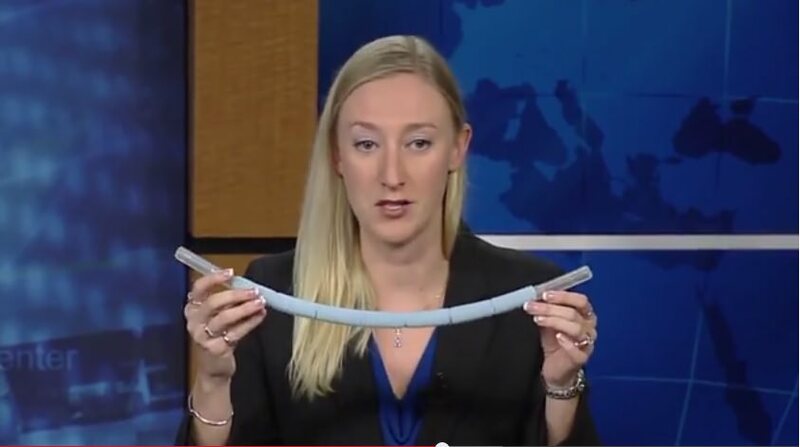 If ammonia does start to shower out, Mastracchio will quickly close the valve and wait a few minutes as it could be just residual ammonia in the line. If that doesn’t work out, Mastracchio is trained on a procedure to attach a device to the front end of the connector and move a lever that prevents a cavity in the line from filling with ammonia. Then he can open the valve again, bleed out the ammonia that’s left over and keep going. Decontamination procedures. The ammonia makes a distinctive “ping” when it hits the helmet, says Wheelock (who yes, heard that happen himself.) You can also see ammonia on the suit, he said, as it looks a bit like candle wax and obscures the stitching. All of which to say, NASA has procedures in place if the agency suspects or can confirm large amounts of ammonia got on Mastracchio’s suit. (Small amounts would essentially fleck off in the sun.) Hopkins, who will be out of the line of fire, can do a thorough inspection of Mastracchio and scrape off any ammonia with a warm metal tool — without hurting the suit underneath. The astronauts could also do a “bakeout” in the airlock — 30 minutes if suspected, an hour if confirmed — where they will sit with the hatch open and wait for any ammonia to sublimate off the suit. Once they close the hatch, the astronauts can verify if the ammonia is gone using Drager tubes, which have gold crystals inside that turn “purpleish blue” in the presence of ammonia, Wheelock said. Margin calls. 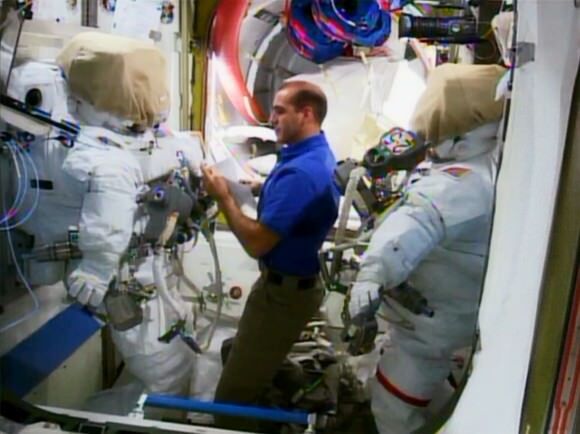 Because NASA needs to make sure the astronauts have 30 to 60 minutes to decontaminate at the end of their spacewalks, officials will preserve a margin of oxygen available for the astronauts to walk through that work. So it’s possible the agency may terminate a spacewalk before all tasks are completed just because they need that bit of margin at the end. To learn more, Wheelock has been answering questions occasionally on his Twitter account from followers, and you can read through what he posts when he finds the time. Universe Today will also cover the spacewalks (currently planned for Saturday, Monday and Wednesday) as they occur.